Once upon a time I would be mistaken for Joan Kirner. I used to look sufficiently like her to fool those who hadn't met her in person. I still get questions about whether I 'miss politics'. I've got a great pic of her, the folk singer Judy Small and me at a fundraiser in 2006. We could be sisters. I first met Joan in 1990 when, as Commissioner for Equal Opportunity for Victoria, I was facing a tough time dealing with death by a thousand cuts and interference with my independence by the Justice Department and a then-hostile legal profession. I got near-instant access and a wry, kind lecture on how to expand the influence of a positive but slight meeting with a powerful office-holder: take notes, confirm what happened in writing as soon as possible after the meeting, and make sure the bastards giving me grief know that she knows, and she cares. They were far more polite for a while after that. The next time I heard her gentle voice was on a conference phone when she enquired, quite properly, about the process I would use to address an embarrassingly public sexual harassment complaint against one of her Ministers. She did not ask for and he did not get any special treatment. The glare of publicity began for me, as it turned up the heat on her in the lead-up to the next election. The former community education activist turned Labor MP and former Minister responsible for Landcare and education change, had graciously agreed to lead the party to an inevitable thrashing by the Kennett opposition. Her treatment at Kennett's and the media's hands was savage and sexist. It hurt, but she didn't let on. Her health was very much affected. Yet she was not considered 'sick enough' to retire on ill-health grounds when she left the Parliament. She got no superannuation on the assessment of a doctor making his decision while Jeff was changing superannuation policy to punish 'the guilty party'. She wouldn't challenge this nor talk about it, and I first learned of it while I was researching her biography more than ten years ago. It left her grateful to her friends who raised funds to pay for a specialist medical treatment for one of the illnesses she had begun to evince in 1994 — osteoporosis. Oddly, the oesophageal condition she had in 1994 was diagnosed as cancerous in 2013. Joan's outstanding quality was her generosity, both personal and financial. She privately bemoaned to me once the fact that, as a pensioner, she could not afford to give more presents to deserving recipients. This quality gave her interactions great warmth. She remembered names, faces, and the back-stories of her constituents and supporters as well as her opponents. She made connections with political strangers on common issues, such as the protection of the environment through the Landcare program. She was the first Premier to make Landcare a formal government policy in the nation. She stayed politically alert on the issues dearest to her heart, participating in public life on terms of equality, public and private respect for the unique perspectives of women and girls, and getting more of them to change the world for the better, in parliament. When her friend Leonie Morgan came back from the US and spread the news about the extraordinary success of EMILY's List, the Democrats' mentoring and fundraising organisation set up to support progressive women political candidates, Joan saw and grasped the opportunity, working with other friends old and new, and all women, to set one up in Australia. She spent more than eight years as the organisation's unpaid national coordinator and spokeswoman. This rattled ALP faction leaders because EMILY'S List was and is not a party-controlled organisation. The networks created and sustained among preselected candidates stand as a powerful endorsement of Kirner's attitude to women in politics: whatever the party, power should be shared among women. 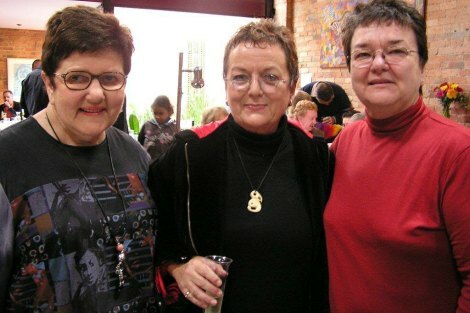 I had the squandered privilege of trying to write Joan Kirner's biography between 2004 and the year she kindly took the responsibility from me, in about 2009, when she deemed, rightly, that I was still in no fit state to finish it after a dark passage in my own life. It and my research materials are in other hands now and I hope the interim-titled Class Act will see light in 2015. I realised, when she died on 1 June, how much I will and have begun to miss our great, sometimes squabbling relationship. It deepened through co-writing The Women's Power Handbook in 1999 — still in print and available through the Victorian Women's Trust, EMILY'S List and me — and travelling the country together, myself with the flu and her with a bung eye and a broken arm. And I will fondly remember working with the Great One, her friends and enemies, on that unfinished biography, and giggling through her secrets. They are safe with me, Joan Kirner. As is your influence in my small life. Ave atque Vale. It quickly became fashionable to denigrate Joan Kirner. Joan Kirner contributed a great deal to the State of Victoria. Moira's words show the real nature of the woman who was a politician and leader of great stature. History will recognise this. It's a pity that great people too often are demeaned by political opponents. Very fine piece, Moira. You are exactly the right person to write it. A moving tribute, Moira, for a woman of substance. Thanks Moira for an informative and moving recollection of a very fine woman. Like many, I admired Joan Kirner from a distance. She was courageous, dignified, generous and more; her legacy is immense and enduring. In schooling, the Kirner government's mantra that education's purpose is to produce equal outcomes contributed to the subordination of curriculum to New Leftist ideology (the background of which can be found in Prof Geoffrey Partington's "Teacher Training in England and Wales", a critique which deserves more attention in Australia than it has received), and the lowering of academic standards. These diminutions, to my mind, served neither education nor justice, not to mention the best interests of students -especially those of poor socio-economic backgrounds. For those who abhor the Victorian abortion law reforms of 2008, that Joan Kirner claimed she had campaigned 30 years for, her earthly passing marks a time of sad reflection and remembrance of the thousands of unborn children who, as a result of these laws she championed, were not given the chance of living to 76, as she was. Joan supported me and my family during a difficult time. She taught me to keep my chin up and keep moving. I will always be grateful. JK was no saint. All political careers end in defeat. History makes its own judgments. Critics of her achievements in public education and decriminalising abortion do not share nor even wish to experience as I did the full glory of one human being's lexistence. So be it. Thank you, Moira. Your words are your own, from your own experience, but I'm sure they'll resonate with many, including me. This certainly is the time to rejoice in all the good, let the rest go. De mortuis nihil nisi bonum, people. RIP, Joan Kirner. Please God, we'll all have that opportunity in heaven, Moira. Critics of her achievements in public education and decriminalising abortion do not share nor even wish to experience as I did the full glory of one human being's lexistence... Were you trying to be ironic Moira? JK cannot be celebrated; her major 'achievement' was in truth the greatest injustice committed in Victorian history. Joan Kirner was a great woman and a great leader. her humour and humanity, and her championing of women will be sorely missed. Thanks Moira Rayner. Such a warm generous article Moira. I was always a fan of Joan Kerner even though I live in a different state. Her humanity & dignity were striking.